The eastern lochan seems to have been deliberately constructed to act as a reservoir for the moat. It’s likely that the area was already boggy, as two burns come down the slope to that point, and the water has been retained by a broad embankment on the west side (which is the downhill side). A single burn carries water out of the lochan through a fine stone culvert. To the south west of the fort is a larger lochan, which has also been encouraged by the construction of an embankment on the downhill side to hold the water. This feature has the remains of a wooden jetty and an artificial island, and is very like what we find near large houses to provide food for the table. This may suggest that this lochan is later than the motte. 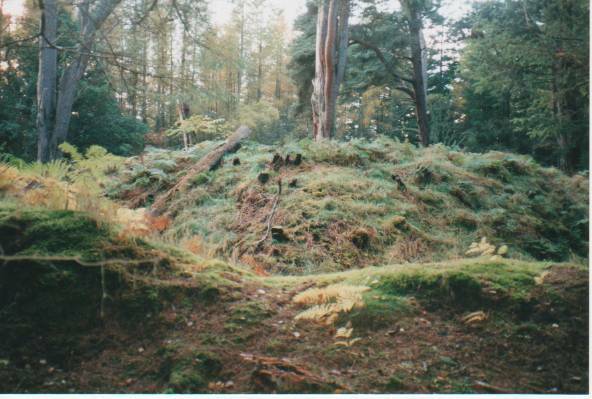 There are also several walls, ditches and dried up ponds in the woods between the motte and the large lochan, all of which are probably considerably later in date than the motte. One feature in the ditch which runs south-west from the moat suggests some kind of water management, but unfortunately this has been destroyed by timber-clearing operations. 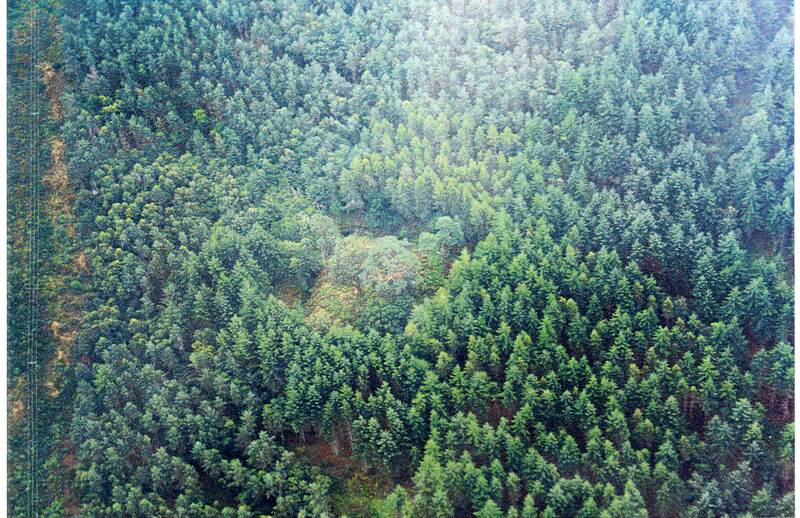 When I first visited David’s Fort in 1998 it was surrounded by forest. Some trees which had been growing on the top of the mound had been felled and the top was covered in bracken. Access was via a dry part of the moat on the south side. On subsequent visits we found that the trees were being felled and the foresters did not seem to be too concerned about respecting the scheduled area. Now the site is much more accessible and easily seen, where before it could be easily missed. As a result some damage has been done to the mound with a path etched in the side giving access to the top. 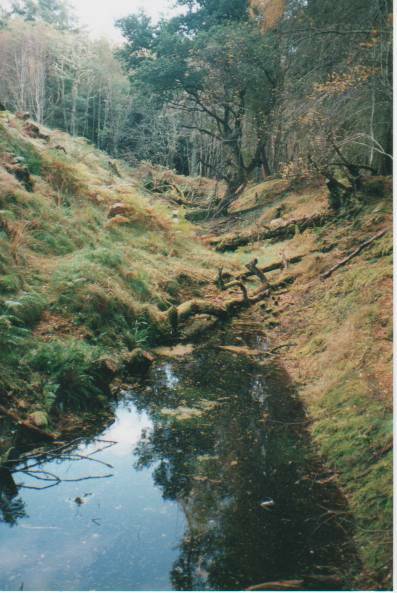 Moat along south side showing present entry point towards top of photo 1998. Interpretation of this site was not easy due to the lack of any primary evidence. Mottes are Norman-French features and most date to C11 and C12. But the earliest documentary evidence relating to David’s Fort is C19. While I’m happy with a C12 or C13 date for this site, it became clear that the site and perhaps its name are the only primary sources. However, our search of the documentary evidence clarified the social and political context of the period demonstrating that in the mediaeval period this area was ‘frontier country’ with the McWilliams from the north, the MacDonalds from the west, the Moray men from the east and the supporters of the Scottish crown from the south all vying for superiority. Dingwall Castle at this time was one of the most important in Scotland. 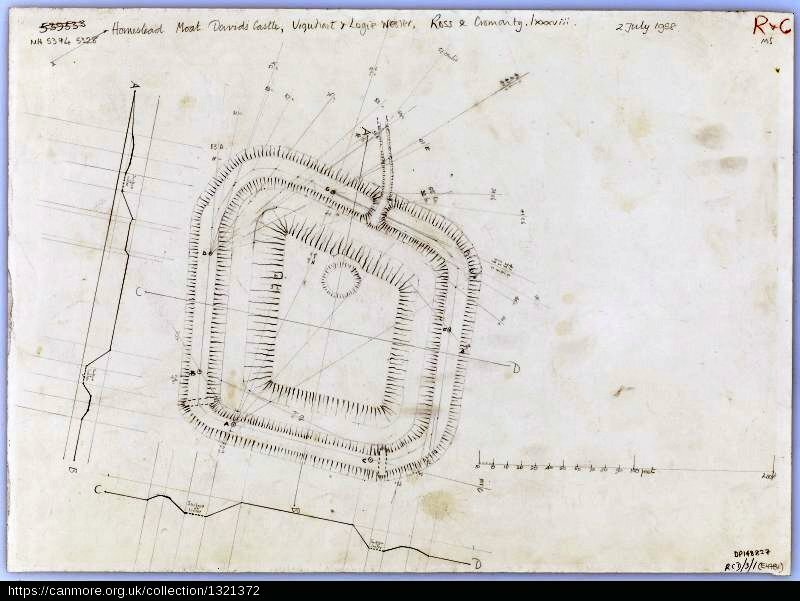 David’s Fort is a name which has been in use since the C19 at least and suggests a military structure, while the archaeologist’s label – ‘homestead moat’ – has domestic connotations. Following the name ‘David’ has not really thrown any light on the subject. There are surprisingly few Davids among the great and the good in the C12, but a possible candidate is David, Earl of Huntingdon, William the Lion’s brother, who accompanied the king to Ross to quell disorder in the area in the last quarter of C12. David I founded the Bishopric of Ross (1124) and imposed feudalism on Moray with the building of the first timber and earthwork castles (1135à). Two Bishops of Moray are recorded by Dowden – David de Moravia (1299) and David Stewart (1462) – though there is no indication that they had any connection with the David’s Fort area. David de Dunhowyn signed a charter at Dingwall Castle in 1380. But there’s no clear evidence that any of these candidates gave their name to this site. 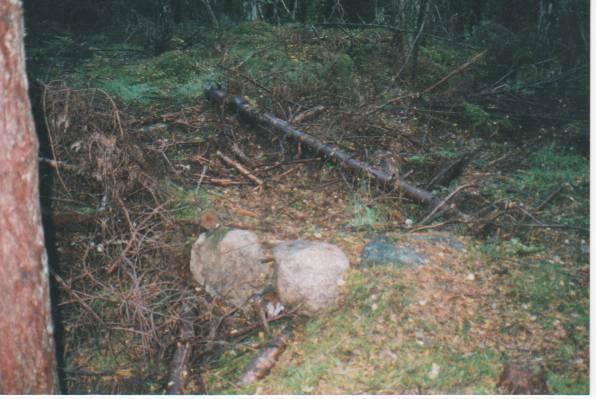 This is a site which was attached to the monastery at Allanfearn – a kind of holiday home for the monks where they could recharge their batteries. Associated with this interpretation was the suggestion that there was a hospital in Conan Wood. The evidence for this was the number of medicinal plants identified in a small area close to the present single track road. Since the name Spittal occurs on the other side of the Black Isle, I wonder if it’s likely that there was another at Conan. This may be a political/administrative site associated with Dingwall Castle, and situated to overlook both the mediaeval road and the ford over the river. There are examples of watchtowers along the Cromarty Firth coast to protect the ferry crossings, e.g. at Ryefield above Alcaig. I tend to favour this interpretation and like the idea of the builder being David, Earl of Huntingdon. This may be the focal point of an estate, a forerunner of Conan House. For a period this area was in Munro hands and David Munro (died 1192) was the third son of Donald Munro. If this is the case, the south-western lochan may well have been part of the policies. Some archaeologists, with one eye on the good preservation of what is essentially a mound of earth, have suggested that this isn’t a mediaeval site at all, but rather an C18 folly. But would guests at Conan House have got excited about a mound of earth! Associated with that idea is the suggestion that building the motte was a job creation project to provide work for unemployed tenants. If it is an C18 folly then memory of its construction would surely have surfaced when the ordnance surveyor was asking about it, or when Beaton was investigating it in C19. I would have expected someone, not least Sir Kenneth Mackenzie, remembering its construction and certainly if it was constructed as part of philanthropic activity, I would expect Sir Kenneth to wish to memorialise his ancestor’s act of kindness. J. Beaton, writing in the Proceedings of the Society of Antiquarians of Scotland in 1883-3 noted that an old man knew the fort as Tigh Diabdh, or house of David but he also notes further that there was no tradition associated with it and this is confirmed in the OS name books. This is a fascinating site, all the more interesting because information is so elusive. There are other mottes and moated sites in the Highlands and it’s interesting to compare David’s Fort with these, e.g. Borgie Bridge (NC6711 5872; HER MHG12597) and Proncy Castle (NH7712 9258; HER MHG11745). Other sites in the area include Conan House (NH5342 5379; HER MHG16151) and Conan Mains Farm (NH5326 5345; HER MHG16572) which are probably built on the two townships recorded in Roy’s map. There is also the churchyard of Logiebride (NH5353 5407; HER MHG39644) and several chambered cairns indicating plenty of activity in this area from an early period. I remember Meryl Marshall mentioning that some of the ponds may have been used for soaking flax. Is this still a possible use or has that been discounted? One of the families residing within the parish of Urray in the 17th century carried the surname Captain or McCapitan and later members of this family, that were settled within the parish of Kilmorack in the 18th century, took the name Morrison, which is the surname they carry to this day. It is not clear how this family acquired their original surname but I imagine that it is possible that one of their ancestors was captain of the watch [a group of men tasked with protecting the tenants from the encroachments of neighbouring clans intent on stealing cattle], or alternatively, their ancestor may have been the Captain or Constable of one of the local castles in medieval times. A distinguishing feature of this family is the fact that each generation of the family carried the name David which, with exception of some of the Rosses, was not at all common within the district. I don’t know if there is any connection between this family and David’s Fort for until today I was unaware of the existence of the site.